February 9 marks the start of the 2018 Winter Olympics in PyeongChang, South Korea. 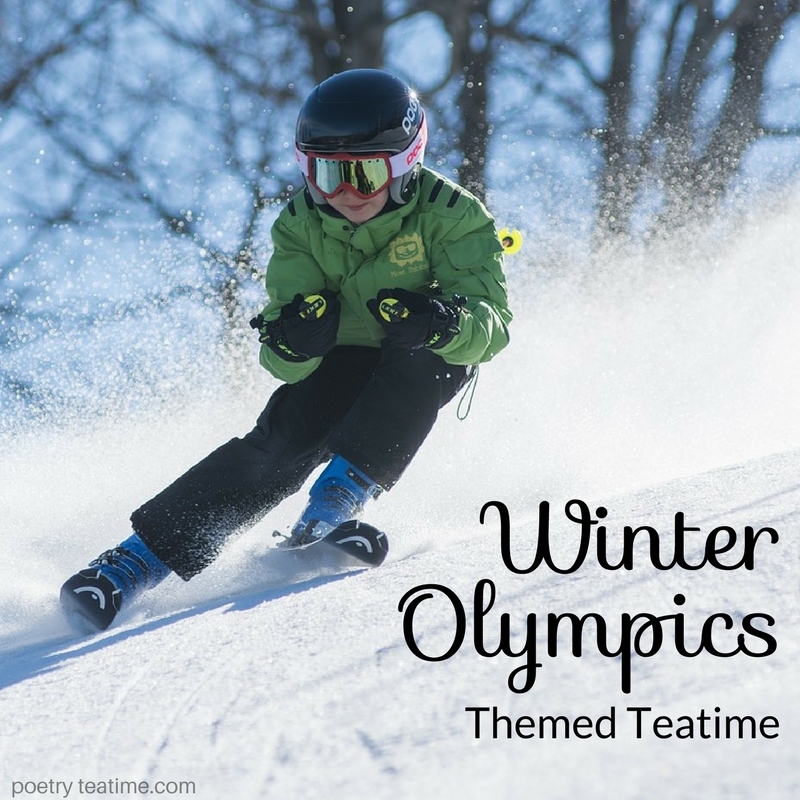 The games will last most of the month of February, so what better time to bundle up, brew some tea, and read some winter olympic-themed poetry! The first Winter Olympic Games were held almost one hundred years ago in 1924 in Chamonix, France. Today, the official sports include snowboarding, hockey, curling, figure skating, skiing, and more! Norway has won the most Winter Olympic medals, with a grand total of 329 medals, followed closely by the US with 282. 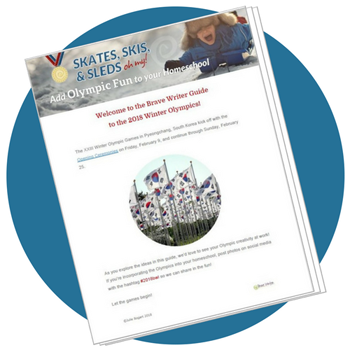 Before we begin, be sure to check out the FREE Brave Writer Guide to the Winter Olympics for even more books and activities related to the Winter Olympics! Let’s start today’s teatime with a short excerpt about the breathtaking joys of ice skating from William Wordsworth’s masterpiece, The Prelude. The pack loud-chiming, and the hunted hare. Wordsworth’s poem captures that breathless rush and swirling beauty of ice skating and childhood so well. Now let’s venture onward into the celebration of a Winter Olympics-themed teatime! Tribute treats: Name a drink or snack after your favorite athletes! Celebrate their achievements with an Ole Einar Bjoerndalen Hot Cocoa (biathlon competitor from Norway with the most medals of any Winter Olympic athlete) or brew up the Seba Johnson Pot of Peppermint Tea (youngest competitor at age 14 for skiing)! Korean food and drinks: Because this year’s Winter Olympics is held in South Korea, try something different with traditional Korean food and drinks during your teatime! Make Korean ginger tea using this recipe—it’s both tasty and good for you! if you’re very brave (and don’t mind strong smells), sample traditional Korean kimchi or fermented cabbage during your teatime. Your local Walmart or grocery store might have other Korean snacks in their Asian food aisle, so see if you can grab some prawn crackers or salty seaweed packets. Also, check out this infographic from Dom & Hyo of 12 types of tea you can find in Korea. Olympic paper chains: All you need is blue, black, red, green, and yellow construction paper, scissors, and tape or glue. Cut the paper into strips and tape them together into a paper chain with official Olympic colors! Olympic ring centerpiece: Go on a hunt around the house or outside. Look for small objects (leaves, post-it notes, pinecones, pebbles) in the five Olympic colors of blue, black, red, green, and yellow. Then place those objects in rings on the table as a centerpiece for your teatime! Inspiration: this post from Edventures with kids. Korean inspiration: Hang up a Korean flag to celebrate this year’s location or use traditional Korean colors of white, red, and blue to decorate. You can also create a version of this year’s mascot, a white tiger named Soohorang, as a guest of honor at your teatime. White tigers are traditionally regarded as Korea’s guardian animal. Ice-skating history: Page through historic poems and illustrations of ice-skating using this online copy of a 1905 classic by Edgar Wood Sayers, titled The Poetry of Skating: Being a Collection of Verses by Various Hands Commending and Describing that Graceful Art. Bonus: some of the poems are written in French or German, so you can learn a bit of other languages, too! Awards ceremony: Make an easy salt dough gold medal following the directions on this post from Paging Supermom, then award the medals to your favorite poems or to the best poetry readers, reenactors, or tea-pourers in your family! Olympic charades: The Olympics are a great excuse to get up and get moving! There are 15 different official winter olympic sports, so why not play a game of charades and see if you can act out and guess each them! For a variation that focuses on figure skating, check out this activity called Move Like a Figure Skater from Creative Family Fun. 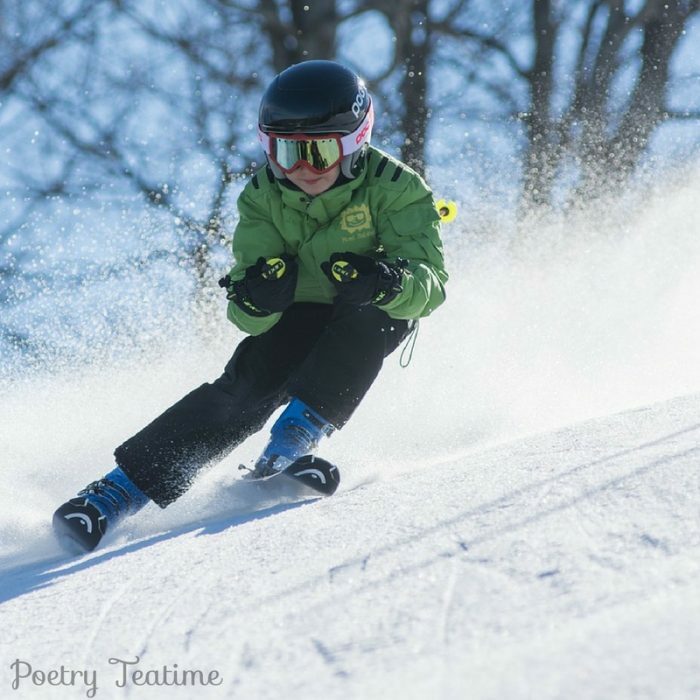 Winter sport acrostics: Pick your favorite winter sport and write an acrostic poem where the first letter of each line spells out the name of the sport!